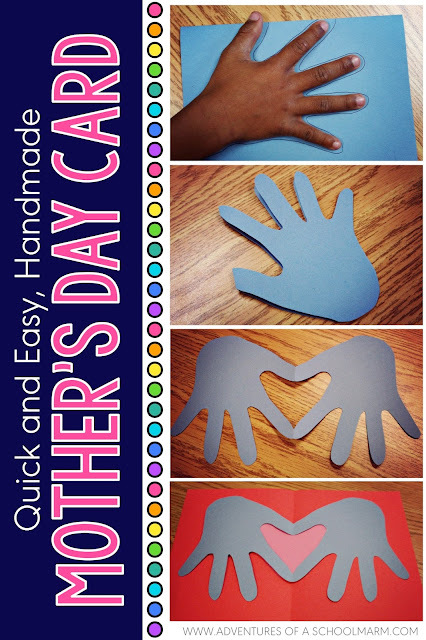 Mother's Day is just around the corner, and this card is super easy to do with your students, especially if you need a craft to make at the last minute. Give it a try! 1. Let students select their own color of paper and fold it in half. 2. Have students place their hands so that the thumb and pointer finger are overlapping the fold. Upon recalling that students will likely be stuffing these (not-so-carefully) into their bookbags to take home with them, I decided that the aforementioned hands were too fragile. Thus, I created the 2 optional final steps below. 7. If you have extra scrap construction paper, feel free to have them add an additional color behind the hands to make the heart a different color. This is for your over-achiever students. You know who they are.